I enjoy fashion and some of the fads. It is one of my guilty pleasures. This fall it was the plaid suits worn by the glamorous “somebodies” during fashion week in London, NY, etc. This is the look shown on a lady close to my own age. and here are others on younger models to show the variety of colors. The jackets were often double breasted, with a peaked lapel. The pants either tapered or cropped. Plaid pants. Not for everyone. In fact for some they are associated with playing golf or the basics of a clown's wardrobe. 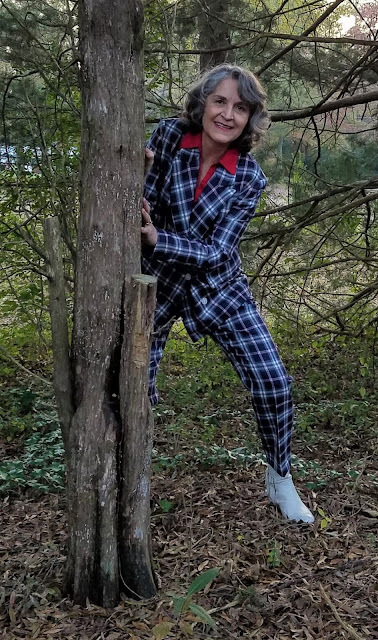 I like plaids, but I realize plaid pants put horizontal lines on my widest body part. 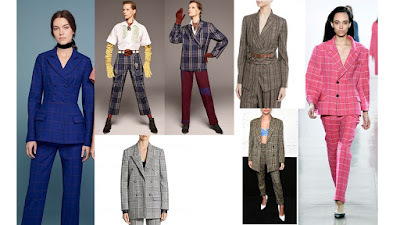 The safest plaids for pants would be muted /dark colors with very little contrast. Boring. 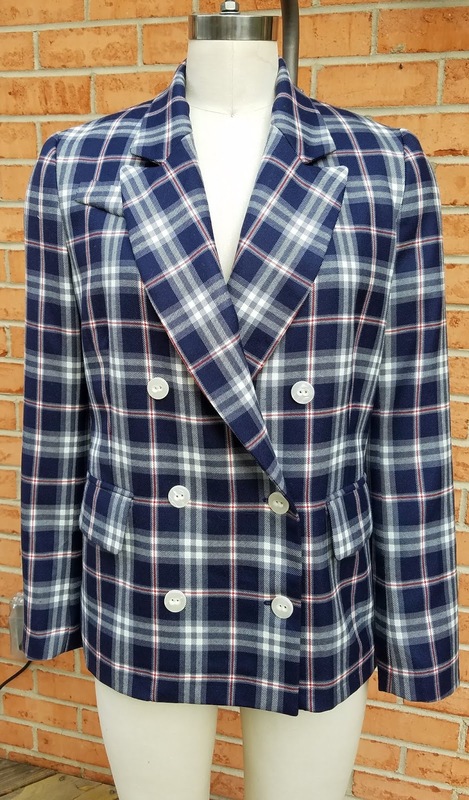 How about a navy, gray, red plaid wool flannel suiting from Denver Fabrics? The colors made me happy. 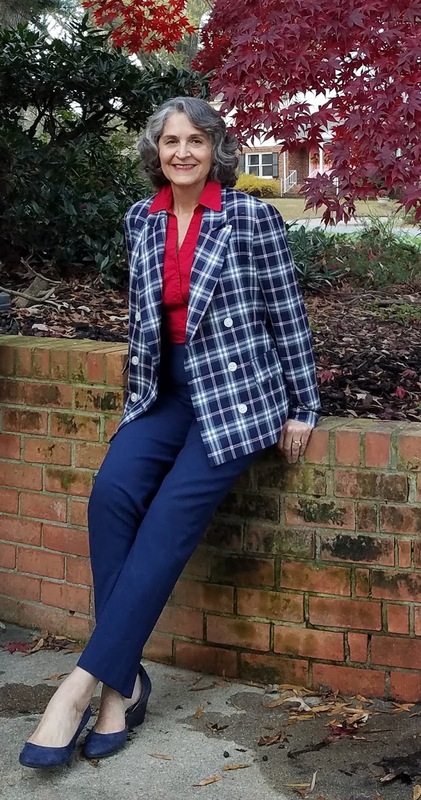 When I sew my own plaid pants, I can achieve a customized fit, and better plaid matching than RTW. And if I don't like them for everyday wear, I tell myself that I just made a pants muslin with obvious horizontal and vertical lines that I can use to fine tune fit. The pants pattern I chose was a high waisted, tapered leg style from Burdastyle 12 2010 108. An easy sew as I left them unlined. The wool fabric had a gabardine weave and hard finish. Not itchy at all. Ah yes, I also bought a pair of cream boots. Fast fashion faux leather for less that the price of a yard of wool fabric from Mood. 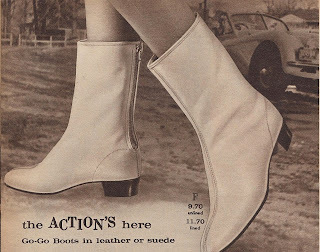 They remind me of the white Go Go boots I had in grade school. I remember those boots because it was the first time I had an article of clothing that was considered in style, and I was so excited about wearing them. Thinking back, I don't believe my mother bought them for me, too frivolous. They must have been a present from my doting paternal grandmother. I remember her fondly for her habit of buying me cool presents (impractical and not age appropriate in my mother’s words) from expensive department stores. I loved her presents. That she thought I was the type of person who appreciated the latest fashion and jewelry. Even though my mother was right. 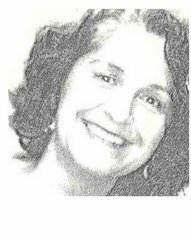 I remember disliking the scent of the Windsong perfume, and the beaded hippie necklaces didn't go with the dresses I wore to school. But the perfume bottle sat on my dresser for years and I still have those necklaces somewhere. For the blazer, the style had to be double breasted with welted flap pockets and a peaked lapel. Patterns for this style of jacket are offered every couple of years in Burdastyle. Burda 7/2015, model 125 and 9/2018 model 117 are almost identical. I chose the latest incarnation from the Oct 2018 issue. It is in tall sizes. I am an inch shorter than the tall size height. I decided that was not enough lack of height to worry about alterations. If I had really thought about all the work this blazer was going to require, this project would have ended before it started. 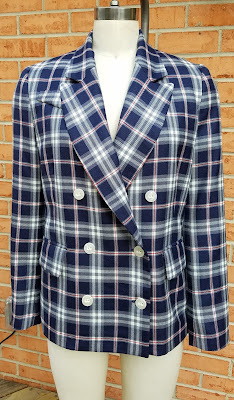 Many seams, plaid layout and matching, welt pockets with flaps, collars with stands and shaped lapels, I haven’t made a jacket like this in years. When it was time to do the welted pockets or the collar and lapels, I definitely needed remedial help. The YouTube series "How to sew a jacket" from Atelier Saison a Japanese sewing factory that sews garments individually, was just what I needed. The video series was recommended by Tany . And while the videos have no verbal instructions, and minimal text translation, which are only visible in full screen mode on my computer, the footage is very clear and the process flow is logical. And though I don't think I would wear both pieces as a suit, at least not to work. I did have fun cavorting around the back yard in them. And taking photos that would embarrass my children. I love the outfit both worn together and with other pieces. I really love the last two pics! And I understand how you felt about making the jacket cause I do that too. I think of a garment to sew, get halfway into making it and wonder what was I thinking! I'm glad you finished it though...cause it's amazing! Love the plaid suit I would so wear it to work. Not an over 50 invisible woman in that outfit. And the plaid matching is spectacular. Wow! Now that was a challenge. And you won. They look fabulous. Beautiful suit! All that plaid matching!! What great makes! I love the way you've modelled both the jacket and the trousers with other garments. I can see how well your new jacket and trousers fits into your wardrobe. Not sure about the jacket and trousers as a suit though! Gorgeous! 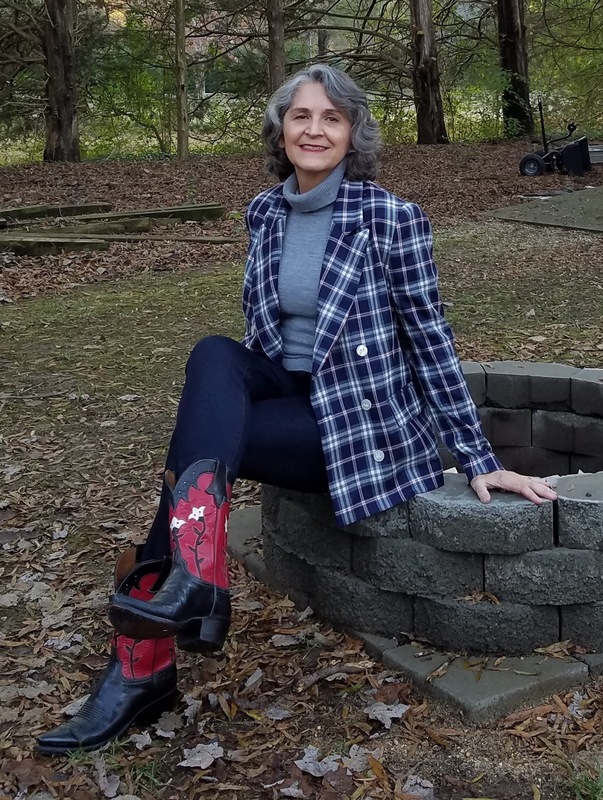 Really love the blazer with the cowboy boots look. Your plaid matching skills are amazing! OMG, you look fabulous in all the various outfits! How versatile and on trend at the same time. Now i want a pair of white booties!! I hope you wear all the outfits out in public to show off your amazing plaid matching and general fitting and sewing skills. Hooray for being able to dress exactly how we want to, no? I love how versatile the two pieces are... they look great in all your outfit matchups! And you brought to mind some really good memories about my maternal grandmother. 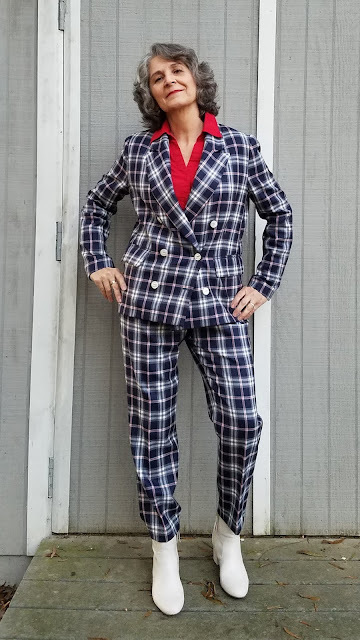 It was Gram who bought me the coolest clothes (including a plaid pants, vest and necktie outfit). She bought me my first makeup (a lipstick). And convinced my mom I was old enough to get my ears pierced finally in 7th grade. Gram had taste and style. Wow, gorgeous, and I love how you styled all the outfits. Those two pieces are amazing.